This is an advertisement for a watch and clock repair shop in London. 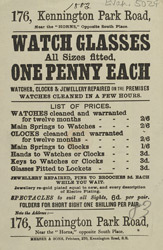 Watches were very fashionable during the 19th century. It was an era of technological development and watches were popular because for the first time they were accurate and lightweight. Second hands were added to the face and they became highly decorative items of jewellery for men and women. Precious gems and diamonds were added to the face and strap and they became important symbols of wealth.